As you read this, I’m winging my way across the country to speak at a conference, so our next regular weekly Bible study won’t start until after I return home and get my household back in order (I’m thinking probably mid-April-ish, but don’t quote me on that.). :0) I have a study in mind, but will keep thinking and praying about it for a few more weeks. During 2014, I led my ladies’ Sunday School class in a chronological read-through of the entire Bible. Each week I taught a lesson from that week’s reading and posted it here on the blog. because she had given a friendly welcome to the spies. 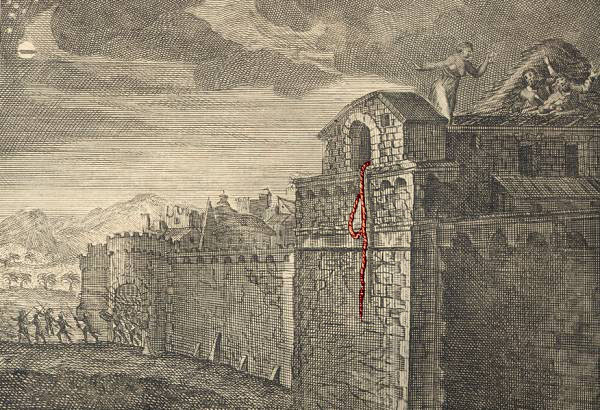 Joshua 1 sets the stage for the story of Rahab and the spies. Moses had recently died, and God “promoted” Joshua to take his place. It was finally time for the Israelites to enter and take possession of the Promised Land. As God “installed” Joshua into his new position, He reminded him… Continue reading. I’m trying to make my way around the web to change the site address anywhere I have it listed, but after seven years with the old address, I can’t begin to remember all the nooks and crannies I need to search out and correct. If you happen to see my old web address listed somewhere, I surely would appreciate a heads up so I can get over there and update it to the new address. And if you’ve been so kind as to link to my blog or any of my articles on your own web site, the old address will work just fine for the next year, but after that, the links will need to be changed to the new URL or they won’t work. Why the change? I originally moved over to WordPress from Blogspot because I was told it was a better platform for marketing and publicity for my book which we were trying to get off the ground at the time. I wanted to use MichelleLesley.com when I was getting settled in at WP, but someone else had already purchased and was using that domain (Can you believe there are TWO of us? :0) So I stuck “books” on the end of the address because the blog was originally intended to be the vehicle for promoting and selling my first book and any to come in the future. So now that my book is out of print, the “books” part is cumbersome and doesn’t make much sense, AND MichelleLesley.com is finally freed up for me to use, so, voila! Wow, the last year just flew by! My old URL, MichelleLesleyBooks.com expired over the weekend. All of my content is still here at MichelleLesley.com, but if you’re using an old link that has “books” in it, it’s not going to work any more, and you won’t be automatically redirected to the new URL. Just go to your browser bar, delete the “books” part of the link, and you should get to the article you’re looking for just fine. If you happen to be reading one of my articles, or someone else’s blog or article, that links to one of my articles with an old link, I’d greatly appreciate it if you’d let them or me know so we can get it fixed. Thanks! Hi ladies! I hope you enjoyed our most recent Bible study, Imperishable Beauty, which we wrapped up at the end of February. Are you using the chronological plan this year? If so, you can find my weekly lessons here (in reverse chronological order, ironically – you’ll have to scroll back to get to the beginning) if you’d like to supplement your reading plan with them. And even if you’re using another reading plan or simply studying through a book of the Bible, maybe you’d like to match up what you’re reading with my lesson that corresponds to the passage you’re currently studying. to be helpful and beneficial. Check out all the men in the series as well as Biblically Sound Blogs and Podcasts by Christian Women at the Recommended Bible Teachers tab at the top of this page.